Learn about careers in justice, public safety, and health at the Justice Institute of BC (JIBC)’s weeklong overnight youth career camp for Indigenous students ages 15 to 18. 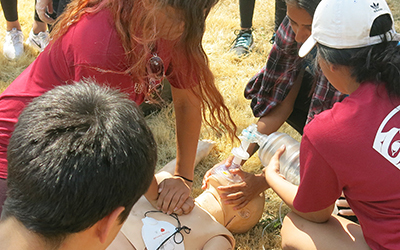 At the JIBC Indigenous Youth Career Camp (IYCC) you’ll get a chance to reflect on your gifts and how you can make an impact by applying them to exciting careers in public safety. The camp will give you a chance to meet new friends from across BC, connect with Elders and role models, and enjoy great food, fun, laughter, and learning in a culturally safe and supportive environment. Apply early to improve your chances of securing a spot! You will make friendships, develop cultural connections, and connect your gifts to future academic and career opportunities. Make memories that will last a lifetime through applied education and culturally grounded experiences in a safe and supportive environment with camp Elders, camp coordinator, camp teachers, and staff. Indigenous youth who identify as First Nations, Métis, and Inuit, between the ages of 15 and 18 (birth years 2000 – 2003). The JIBC Indigenous Youth Career Camp will be based at Sts’ailes Lhawathet Lalem Healing Retreat Centre. Youth and supervisory staff will be transported between Sts’ailes Lhawathet Lalem and JIBC campuses on a chartered bus. Cultural activities and team building activities will also take place at Sts’ailes Lhawathet Lalem Healing Retreat Centre. Daily activities will take place at the following JIBC campuses: New Westminster, Chilliwack, Maple Ridge or Pitt Meadows. Download the application package here. Application deadline is February 25, 2019 – you are strongly encouraged to apply early to improve your chances of securing a spot! Call the Justice Institute of BC at 604.528.5522 for more info on the JIBC Indigenous Youth Career Camp. Looking for more opportunities for Indigenous youth? Click here to view our other postings about career, education, and cultural opportunities and more. View our program page for a full schedule of what’s happening at UNYA this month, and learn more about our 20+ programs for Indigenous youth.